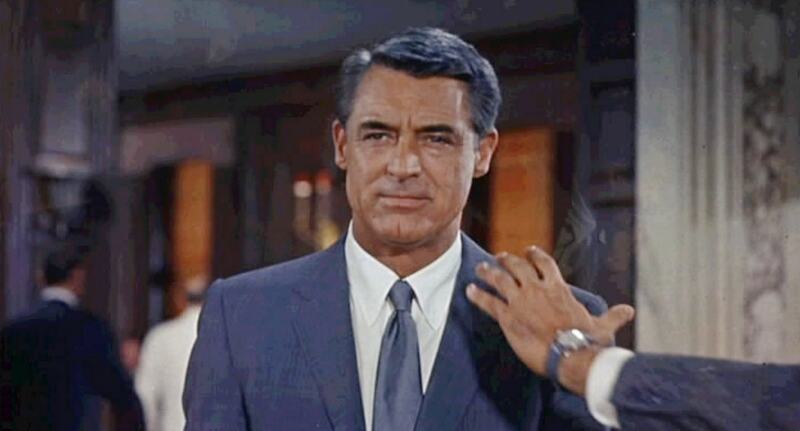 The blue/grey plaid suit Cary Grant wears in Alfred Hitchcock’s film North by Northwest was recently named the most iconic suit in cinema (by Esquire) – narrowly beating Sean Connery’s grey plaid three piece from Goldfinger. Both of course have Savile Row origins and both, like the best suits, have aged well. Esquire pays tribute to the ‘timeless design’ of Grant’s suit describing it ‘as fresh today as it was in 1959’. As a fan of the film, the actor and bespoke suits, I decided earlier this year to commission a suit from Chris Kerr, as similar to the North by Northwest suit as possible, whilst allowing for a more modern cut. It seems particularly fitting to do this now as 2016 will mark the 30th anniversary of the death of Cary Grant – one of the best known and best loved of British actors (don’t be fooled by the accent, he was born in Bristol). I started my research by reading a few of the excellent blogs dedicated to the North By Northwest suit. However finding conclusive information about the origins and design of the suit turned out to be harder than I expected. While it’s generally accepted that the suit material is patterned in a ‘Glen check’ or plaid, the colour attributed varies from blue/grey to medium grey. Looking at stills from the film, the suit looks mostly grey (possibly due to the technicolour process), though in some shots there is a definite blueish hue to it. The maker of the suit is also up for debate. While some sources say Arthur Lyons of Kilgour French and Stanbury made the original suit, the label of Beverley Hills tailor Quentino can also be spotted in one of the scenes. There’s speculation that Quentino made extra copies of the suit for the film, some say 16 suits were used in the filming. 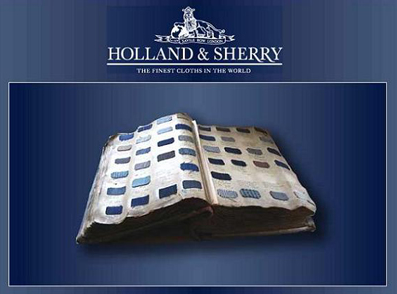 With information about the suit less than certain, I decided to go and see cloth makers Holland & Sherry, as one thing everyone seems to agree on is that they provided the original cloth. I sat down with Nicolas Guilbaud and started by showing him clips from the film on You Tube. My main concern at this stage was colour. While reports say it’s a blue/grey, on film it looks just grey. Nicolas was able to explain that it was certainly the blue grey Glen check but due to the filming process, it looks grey on screen. Excitingly he also confirmed they still make the cloth and went off to find me a sample. With the cloth tucked under my arm, I popped over to Soho to tell Chris the good news and found that amazingly he had accurately guessed the cloth number of the 13oz/400gm cloth from the still of the movie I’d sent him.